The harsh winter still is being felt on some Midwest wheat fields as the production estimates were reduced by the U.S. Department of Agriculture. U.S. winter wheat production is forecast at 1.40 billion bushels, down 9 percent from 2013. As of May 1, the nation’s yield is forecast at 43.1 bushels per acre, 4.3 bushels below last year. Expected grain area is forecast at 32.6 million acres, up slightly from 2013. The USDA estimated hard red winter harvested acreage about 10 percent higher than the previous year. Soft red winter harvested acreage is expected to be down 19 percent from last year. SRW winterkill losses were reported across Illinois, Missouri and Michigan, where lower-than-normal spring temperatures coupled with higher-than-normal precipitation throughout the winter hampered crop development. In the southern Great Plains states, drought, winterkill and freeze damage have affected the potential yield results in Kansas, Oklahoma and Texas. Most of the wheat-growing areas in the southern Great Plains are in severe to exceptional drought stages. 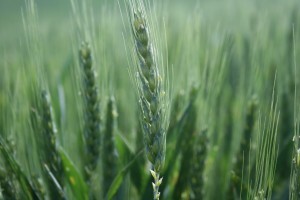 Kansas, Oklahoma and Texas winter wheat was rated in good to excellent condition as of May 4 at 17 percent, 6 percent and 13 percent, respectively. In California, producers are expected to harvest a record-low acreage due to exceptional drought in the winter wheat growing area. In the Pacific Northwest, there were isolated reports of winterkill across the three-state region. Rainfall will be necessary to maintain current conditions and to aid in further crop development. Nationally, 29 percent of the winter wheat crop was headed by May 4, six percentage points behind the five-year average pace. The USDA estimated Illinois winter wheat yields to average 64 bushels per acre, down three from last year’s record yield, on 675,000 acres. Total production is projected at 43.2 million bushels, 12.4 million below the 2013 yield over 830,000 acres. Indiana’s estimated winter wheat yield is estimated to average 66 bushels per acre, seven below the record yield in 2013. Acreage is estimated at 390,000 acres for total production of 25.74 million bushels, compared to 32.12 million bushels over 440,000 acres in 2013.